Welcome to the Time Price Analysis Blog. Here you will find articles and analysis from our experts on some of the trends we are following and the market movements we expect to unfold. If you would like to receive updates when we post new articles then join our mailing list but if you would like to see the data behind our articles then start your free trial . Bitcoin has hit the Buy Zone! Don't get caught up in the fundamentals of digital currencies, it's just a trade. 4 steps to huge returns, but keep exposure small, it won't take much capital to make huge returns. Bit coin has now completed a full five wave move down off the Sub Minuette Degree b Wave high seen on 4th September. The move down should be the Micro Degree Wave 1 of the Sub Minuette Degree wave C and the subsequent upside reversal is the Micro Degree Wave 2. 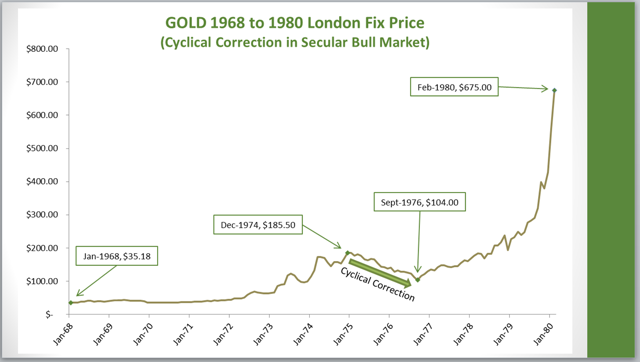 A clear correlation in gold price now to that of the 1970s. The time for investors to take action is nigh upon us now. Industry consolidation is a tell tale sign of a sector low. The recent low in the ES at 2605 came just shy of hitting the 1.00 extension at ES 2600 for the entire move down off the recent ATH. Since that low we have now seen ES make a strong move to the upside. IF we have now seen the swing low for this move down in the ES then we now need to see it clear the resistance zone (2770 - 2862) shown in the Daily Chart .Below there 2824 is the key pivot now in the ES and while we are below that level we can still see further declines into the support zone shown in the 60 Minute chart. NG has continued to push gradually higher after the large gap up the other week. We have now reached the 123.6% for the a to C wave relationship in the Wave V of what looks to be a diagonal structure. We will need to see a full 5 wave move down with a subsequent retrace and follow through lower before a local high can be considered in and then assess the next move lower for likely levels. It is now more likely that this entire move up is the Minor Degree Wave A of the larger Degree Wave (3) (See daily Chart) and that the next move down will therefore be corrective. With the continued move higher in the EURUSD it is now un clear if we are still in a Minuette Degree wave (IV) with the Minuette Degree wave (5) sill ahead to complete all of the Minute Degree Wave 1 down off the February 2018 high OR we are now in the Minute Degree Wave II back up already with the Minute Degree wave 1 having completed at the August 15th low. On Monday the ES came up to the 1.00 extension in an A B C structure off last weeks low and then reversed down to make an new local low. That low came just shy of hitting the 1.00 extension at ES 2600 for the entire move down off the recent ATH. Since that low we have now seen ES make a strong move to the upside. IF we have now seen the swing low for this move down in the ES the we now need to see it clear the resistance zones shown in the 60 Minute Charts. Gold, silver and miners are setting up for huge upside potential. Silver will outpace gold in the next move up. Silver miners should be part of your miners portfolio. Upside price targets for both silver and gold. GC pushed strongly higher last week thus confirming that the Minuette Degree Wave (IV) is still in progress and that we are seeing the Sub Minuette Degree Wave c up towards 1238-1242 area. Once this move up completes we should then see GC turn back down in the Minuette Degree Wave (V) of Minor Degree Wave 2 down to the 1149 target level (See Daily Chart).